Do you have any special Minecraft Java resource pack but now you are playing Minecraft PE and you really want to port it to Pocket Edition? Alas, the textures from PC are not compatible with PE and so many creators move the textures step by step while spending a lot of time. You can avoid this by using Resource Pack Converter. This is a handy application that can easily and quickly port Java resource packs to Minecraft Bedrock Edition. The app requires no more than a minute for porting and is applicable to blocks, objects and things, but there are drawbacks such as the inability to port beds, potions and some items. 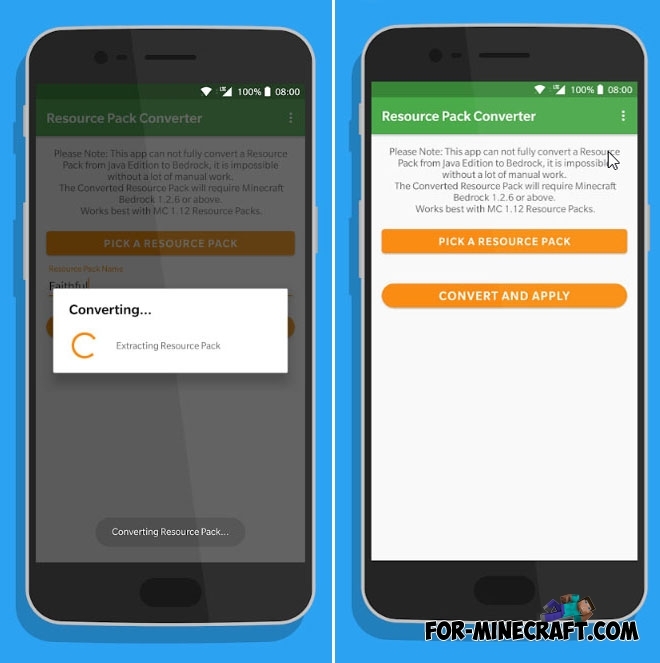 Resource Pack Converter is constantly improving and gets more features. Download the latest version from the link below or from Google Play. Also you can download ready-made texture packs for Minecraft PE.